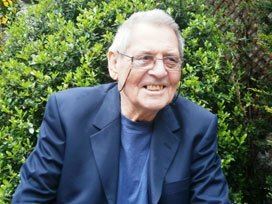 He was a Doctor Who jack of all trades, but Derrick Sherwin, who died on 17 October at the age of 82, will be best remembered as the man responsible for creating UNIT. Producer Derrick Sherwin died after a long illness. Producer Sherwin worked on Who writing scripts, producing the series for the transition between the second and Third Doctor, and even appeared in one scene, playing a Car Park Attendant in the 1970 story Spearhead from Space. But his real legacy came in 1968 when he created the United Nations Intelligence Taskforce or UNIT for the story The Invasion. Born in 1936, he worked first in theatre before moving into television in 1958 and appearing in the show Duty Bound. His early work in dramas including as Here Lies Miss Sabry, The Edgar Wallace Mystery Theatre, United! and Armchair Theatre. He joined Who as Assistant Script Editor to help the incumbent Peter Bryant who was preparing to take over as producer. It was a baptism of fire as he was immediately charged with rescuing a number of scripts which were not ready for production. He told Doctor Who Magazine. “It was just before Christmas, and I was landed with a great pile of scripts that had to go into production immediately after the holiday break. He took over as Script Editor for the 1968 story The Dominators and later that year had the chance to write his own story from scratch. The result was The Invasion, the Cybermen story that set up the pattern for the series for much of the next five years. Sherwin felt the series had become too fantastical, with different monsters every week. He wanted to give the series a more grounded approach and saw as his inspiration the 1950’s Quatermass stories. To help achieve that he took a character created for the story The Web of Fear, Colonel Lethbridge-Stewart, promoted him to Brigadier, and created UNIT around him. Sherwin moved into the role of producer for the last Patrick Troughton story, The War Games, which also featured his ex-wife Jane as Lady Jennifer, and was responsible for casting the Third Doctor Jon Pertwee and overseeing the series move from black-and-white to colour. He left the series after Spearhead in Space moving on to produce the series Paul Temple and later The Man Outside and Perils of Pendragon. But that was not the end of his love for Doctor Who and when the show was under threat of cancellation from the BBC he offered to buy the franchise and produce it independently however he was turned down. Sherwin died on the 17th October after a long illness.